Perfection and Problemlessness ain’t happening! 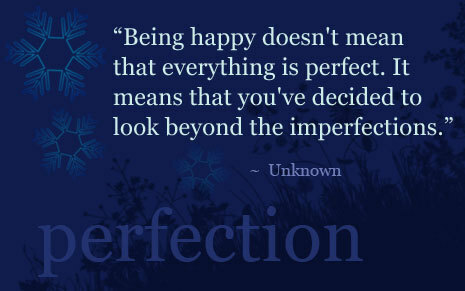 Being happy does not require ‘perfection’ or a ‘zero-problem status’ as a pre-condition. In fact, both perfection and ‘problemlessness’ are impractical goals. We will never get a problem-free or perfect Life. So, you can go on postponing happiness as much as you want, in the hope that you will first ‘sort out things’, ‘mourn your losses’ and then ‘be happy’. Only that, when you do finally ‘wake up’, ‘willing’ to be happy, you will find that the years have gone by, you are walking towards your sunset and that there’s very little or no time left __ to live or be happy! Examine: Are you grieving? Are you mourning a loss? Are you facing a seemingly unrealistic challenge? If yes, ask yourself, how is postponing happiness, going to remove the condition that is causing you grief or replace what you have lost or tide over your challenge? You get the point? So, just chill. Author AVIS ViswanathanPosted on August 24, 2013 March 14, 2016 Categories Art of Living, Happiness, Inner Peace, Intelligent Living, Perfection, ProblemlessnessLeave a comment on Perfection and Problemlessness ain’t happening!